Creative Social Widget • Social widget for Joomla! What is the difference between free and commercial versions? Free version has the copyright information in the bottom of the social widget. are available only in commercial versions. More then 10 social platforms! The following social platforms are available - Facebook, Twitter, Google+, Youtube, LinkedIn, Pinterest, Vimeo, Soundcloud, Myspace, Flickr, Delicious, Vkontakte, Odnoklassniki, Rss. New platforms will be added soon. Live Preview wizard! 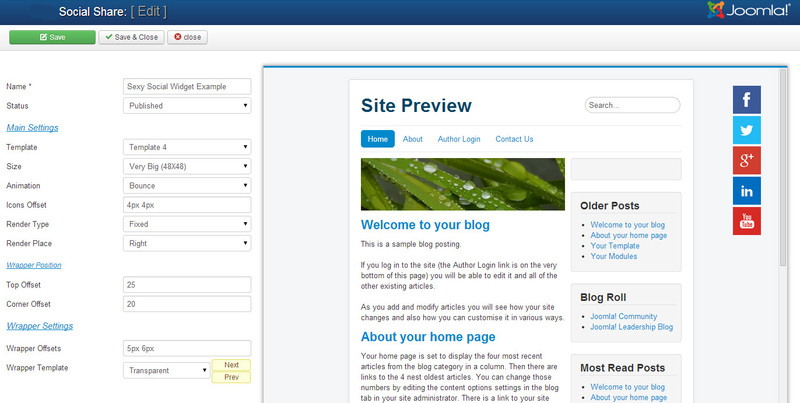 It is packed with a Live-Preview wizard to integrate social icons into any kind of design without css knowledge!. See screenshot! It comes with 4 icons templates. See live demo! Creative wrapper styles! More then 100 wrapper styles, seperated by colors (Gray,Yellow,Brown,Green,Blue,Red,Pink,Blue,Wood,Black). Ability to set custom background color! Different Icon Sizes! It comes with 5 icon sizes (64X64,56X56,48X48,32X32,24X24)! 2 render types! It comes with 2 render types - fixed(left,right,near-content[left/right]) and normal(in any module position)!